So... This is our BIG NEWS! This is our baby! Head on the left, facing away from every one, little arms just showing and a hint of legs down the right hand side. I'm sure I can see it's BUM CHEECKS! I am so impressed with this scan! I thought that it would be really hard to see the baby and we would not really be able to make it out. I had visions of us smiling and nodding while the ladies in the ultra sound pointed to bits of the screen and told us what parts of baby they were, while we couldn't actually make them out. This little baba - aside from being determined to keep it's back to us (no doubt in a mood for being squashed between a full bladder and a scanner) - performed brilliantly! First thing we saw was the heart beat, then the head, then the body, and the arms, and the legs... and then it did a little wiggle! It look like it had just hiccuped for something! 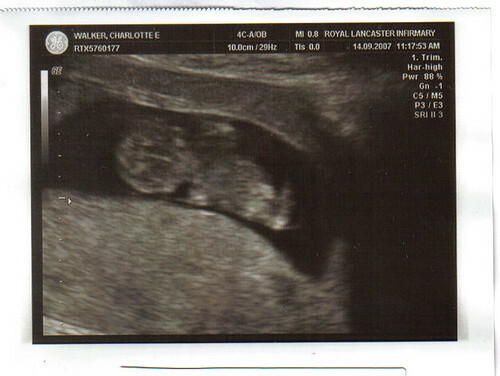 Then as the scan went on it started to roll about and wriggle all over the place and I just couldn't keep my eyes off the screen! Both me and Yorkie had silly grins on our faces and I can't stop giggling about it, although we did manage not to start sobbing (it was a close call though). Now it finally seems so real! We've spent a tenner on photos so we and all the grandparents can have one! can't you tell it's our first!